If you need a DAW for audio recording you'd be a fool not to give Record 1.5 a try. New Neptune tool is fantastic. Easier sequencing. Free to current Record users. Not compatible with Reason 4. Reason 5 might be grabbing all the headlines, but its sibling, Record, is no slouch either. 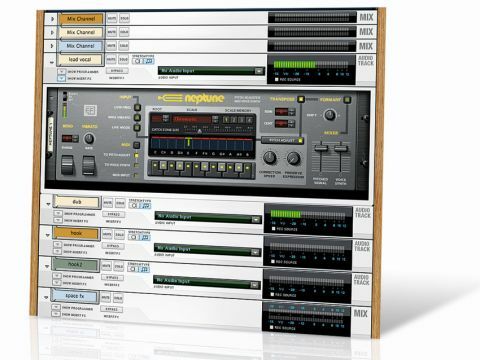 Whereas Reason is aimed primarily at electronic music styles, Record is more akin to a traditional DAW, with full-on audio recording, superb real-time timestretching and a mixer that's modelled on an SSL console, complete with bus compressor. The free 1.5 upgrade offers up a number of persuasive reasons to upgrade, crossgrade or purchase it outright. First and foremost of the new goodies is Neptune. Finally bringing the joys of auto-tuning to Propellerhead users, it does a fantastic job of correcting incoming monophonic audio, giving control over expression, vibrato, correction range, formant control and speed. The result is a device that can gently smooth over vocals in myriad styles, or generate the characteristic robotic effect we've heard on almost every R&B track of recent times. It does all of this quickly and with the minimum of fuss. You can also manually play in notes with a MIDI keyboard, making for a sort of vocoder/auto-tuner hybrid. If that's not enough, Neptune's voice synth enables you to play vocal harmonies alongside the original, even allowing chords. These can be wired to separate outputs and treated on a new channel, for full control. And, of course, you can mute the dry signal altogether, instead playing completely new polyphonic vocal lines. A single word will suffice to sum up Neptune: awesome. Add to this the heightened sequencing functionality introduced by Blocks, the superb new arrangement system shared with Reason, and a number of smaller tweaks, such as drag-to-timestretch (very welcome indeed), Clip Normalisation/Reverse and an expanded ID8 patch library, and you're looking at one tasty update. It goes without saying that all current Record users should grab this update without thinking. Reason users, on the other hand, now have a greater incentive to splash out for both products.